Pro’s: It’s so much more than cabaret and acrobats as each performer gives their character personality that draws the audience in even more. Con’s: As always at the Underbelly, the views can often be obscured without any banked seating. Always a great show, but following a slight injury at tonight’s performance, you are left in greater awe at the efforts every artist goes to entertain. The beauty of live performance is that anything can happen. It be the same script every time, but there is always a difference here, an error there, or an accident can occur. 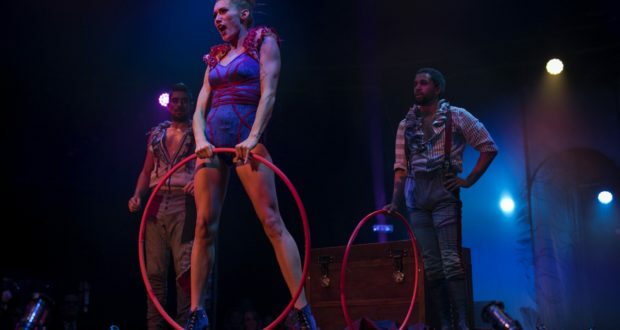 When the show in question is Black Cat: Bohemia, a high octane cabaret performance with acrobats flying everywhere, there is always a risk of something going wrong. So when halfway through tonight’s show Leon Fagbemi, aka The Maestro, somersaults his way across the stage, appearing to execute a perfect landing before hobbling off the stage, you realise that the risk these people go to night after night for our entertainment should be applauded even louder. Even more impressive was the speed in which they rejigged the rest of the show, having to cut a scene or two due to The Maestro’s unavailability to perform further. And they did that with what appeared to be effortless ease. It wasn’t even until after the show and a quick press release sent to apologise that most people would have even realised they didn’t get quite the full show. 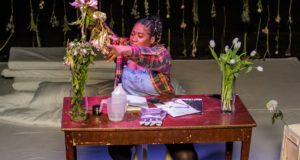 For that alone, Black Cat’s cast of wonderfully skilled performers deserved the standing ovation that came as soon as the lights faded on the night’s performance. 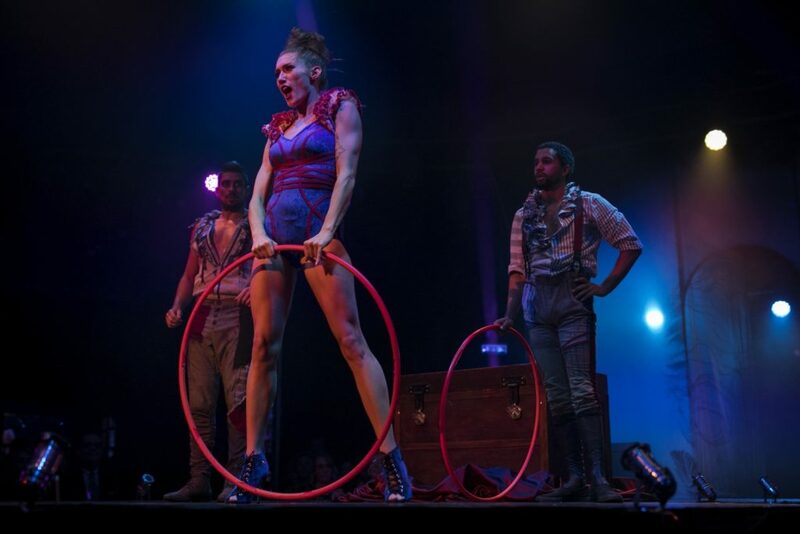 Accidents aside, what else can you expect from Bohemia, their first headlining of the always wonderful Underbelly summer festival of circus, cabaret, comedy and endless variety? The emcee, Laura Corcoran’s Frisky, is a force of nature, with her self-confessed look of Ginger Spice meets Tim Burton, belting out her innuendo and songs, including a wonderful version of Nirvana’s Smells Like Teen Spirit to accompany one of the acrobatic acts. But what makes Black Cat even more enjoyable is how each performer takes on their own character, adding a little story to what is already a superb visual enjoyment. Katherine Arnold’s Danger K is a drunk, who will only perform when lured out with booze. Nicolas Jelmoni and LJ Marles’ The Knave double act are the fools of the piece, but get the biggest cheer of the night as they embrace after a falling out over a woman. 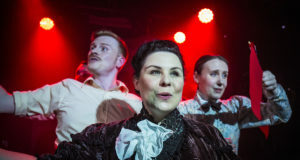 The woman in question is Charlotte O’Sullivan, superbly portraying a bored bubble-gum-blowing youngster; her acting skills were on show even before the show started as she wandered around the audience as if looking for a means to get away to go clubbing. Whereas Black Cat’s better known peers such as La Soiree or Cirque du Soleil are just a collection of performers, Black Cat’s beauty is in the interchange between the team, each offering supporting roles in each others’ acts. Bohemia is a worthwhile night out, but hopefully they won’t suffer any more injuries for the rest of the run. We can only hope that Leon Fagbemi recovers quickly and is back in time to impress you as much as the rest of the team did without him there tonight.